Building your home gym is still possible even if you have limited space. There are plenty of foldable types of fitness equipment that can save a lot of space inside your house. If you want to have an exercise bike, the Ultrasport F-Bike is one of the current bestsellers (via amazon.co.uk) on the market today. It’s foldable, lightweight, and on top of that, it’s reasonable for its price. Indoor cycling is a great exercise, especially with today’s unpredictable weather. That’s why exercise bikes are a great investment if you want to get fit in the comfort of your own home. The Ultrasport F-bike offers an effective workout, and it comes with a space-saving design. It also looks very sleek with a touch of red on the console. This product seems very stable with a maximum user weight of 100kg, and the height of the seat is adjustable making it usable for the whole family. If that’s not enough for you, check out its bigger brother, the Ultrasport F-bike Heavy which can accommodate users up to 130kg. 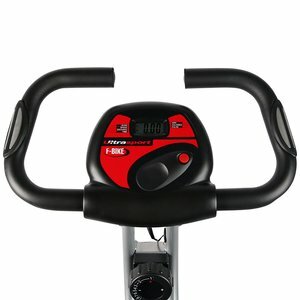 This exercise bike is very simple, and it has no pre-set programmes, but it provides you all the things you need. Also, intensifying your workout wouldn’t be a problem because of the eight resistance levels that are easily adjustable during your exercise. There are hand pulse sensors integrated on the handlebars of the Ultrasport F-bike. These pulse sensors monitor your heart rate, so they’re a helpful addition to any fitness machine. Keeping track of the heart rate is vital for you to attain optimal results after every workout session. It also makes sure you’re working just enough for your fitness level, so you don’t exceed. You can monitor your heart rate through the LED display which also shows the time, calories, speed, and the distance. It’s great news for beginners to know that the Ultrasport F-bike is very easy to use and assemble. It also has eight resistance levels to add challenge to your workout as you improve. It’s possible to use this while watching television because it has a magnetic drive that operates silently. However, the highest resistance level isn’t very challenging if you want an intense workout. This exercise favours those who are new to exercising and for those who just want low-impact cardiovascular training. The Ultrasport F-bike is probably lighter and smaller than some of your current household items. It only weighs 14kg, and it measures approximately 112 x 43.5 x 80.5 cm when unfolded. And because it’s foldable, you can easily transfer it to your storage room even by yourself. When you have visitors coming, you can hide it somewhere, so they won’t know you’re secret to becoming fit! Reviews say that the seat of the Ultrasport F-bike is quite uncomfortable during the first sessions. But eventually, they realise that it isn’t an issue if you just focus on the workout. However, if you’re bothered by it, you can purchase a separate saddle that will make your workout as comfortable as it can be. 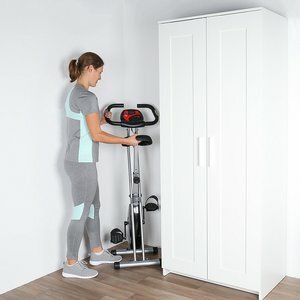 If you’re looking for an exercise bike that can provide an intense workout, the Pleny Foldable Fitness Exercise Bike might be the answer. It has 16 levels of magnetic resistance, and that’s double the resistance of the Ultrasport F-bike. The high-end curved crank arm is integrated into this exercise bike to prevent you from knocking your heel on the crankset (and we all know that’s painful). This product is made of heavy-duty steel, but it’s still lightweight. 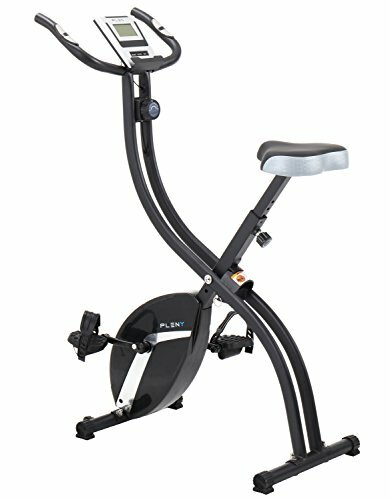 Storage isn’t also a problem with this exercise bike because it’s foldable and has built-in wheels. 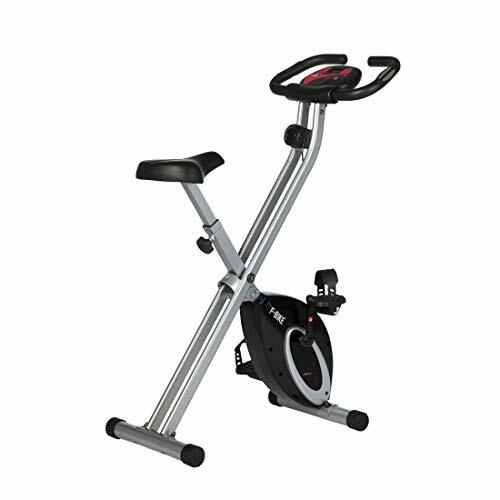 The ReaseJoy Foldable Magnetic Exercise Bike has a 2.5kg cast iron flywheel which is heavier compared to other models within its price range. That means it can provide faster results without having to spend more. It has hand pulse sensors on the handlebars just like the Ultrasport F-bike, and it also has eight levels of resistance. The seat is adjustable, and it has a clear LCD console that shows time, speed, distance, calories and pulse rate. And just like all the other exercise bikes compared, this one is also lightweight and foldable. 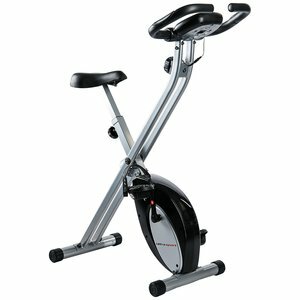 Foldable exercise bikes are efficient types of fitness equipment no matter how much or little space you have at home. The Ultrasport F-Bike isn’t the most affordable one on the market, but you can’t compromise quality with the price. It’s always better to invest in something worth a little more than waste your precious money on things that won’t last. 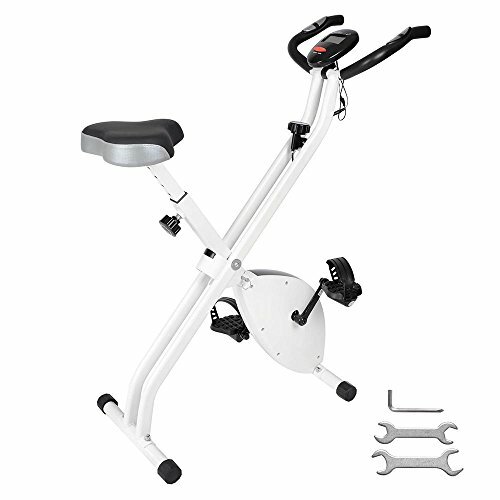 This foldable exercise bike looks good and serves its main purpose of providing an effective cardio workout to keep you fit and healthy, and it comes with a 2-year warranty.